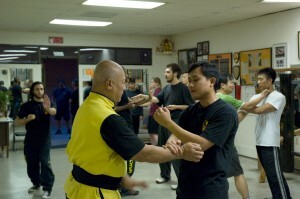 Sifu Eddie Chong is recognized worldwide by martial artists as a prominent practitioner and instructor of Fushan Kung Fu. Sifu Eddie began his training of Wing Chun in 1968, leading him to a journey that made him devote over 50 years of his life to Kung Fu. His Wing Chun lineage in the Yip Man system can be traced to Leung Sheung, Yip Man’s first and one of his most prized student. To further his understanding of the concepts of Kung Fu, Sifu Chong traveled to Fushan (Canton, Mainland China). Being there, he was accepted as last disciple and subsequently heir by Grandmaster Pan Nam, a direct descendant of Shaolin Kung Fu. Pan Nam was the first Wing Chun Grandmaster to be recognized and acknowledged by former President Mao Zedong. 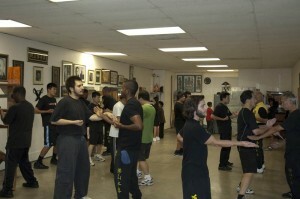 During subsequent visits to Fushan, Sifu Chong was introduced to the Bak Mei (White Eyebrow) style of Kung Fu, which enhanced even more his understanding of the fighting principles that characterize realistic self-defense. Sifu Chong is known for his willingness to share the skills and training methods which characterize both Wing Chun and Bak Mei. He has been subject of articles in several martial arts magazines, including Black Belt Magazine (May 1992) and Inside Kung Fu (September 1985, December 1988, and a two-part feature in July and August 1993). Authors Robert Chu, Rene Ritchie and Y. Wu featured Sifu Chong in “Complete Wing Chun” (Tuttle Publishing).